The UT Martin Skyhawks travel to State Farm Center to play the Illinois Fighting Illini on Sunday, November 12, 2017. UT Martin heads into this matchup after finishing last year with a mark of 20-11. They had a point differential of 2.0 as they averaged 77.2 points per contest while giving up 75.2 per game. Illinois had an overall mark of 18-13 last year. They averaged 71.8 points per contest and gave up 69.9, which was a point differential of 1.9. Matthew Butler averaged 13.7 points per game in 35.8 minutes per contest last season. He averaged 3.7 assists per contest and 2.9 rebounds per game. His field goal percentage was 41% for the year while his free throw percentage was 71%. Jacolby Mobley averaged 19.5 points per game while playing 35.3 minutes per night last season. He pulled down 2.9 rebounds per game and dished out 2.1 assists per game as well. His field goal percentage was 43% while his free throw percentage was at 78%. The Skyhawks allowed 75.2 points per game to their opponents which ranked them 255th in the nation. They also allowed a 44% shooting percentage and a 35% average from behind the arc, ranking them 198th and 180th in those defensive categories. Opponents averaged 32.9 rebounds a game which ranked 63rd, and they gave up 15.4 assists per contest which put them in 321st place in the country. They forced 13.8 turnovers per game which ranked them 234th in college basketball. UT Martin averaged 77.2 points per contest last season, which ranked them 87th in Division 1. Their average scoring margin was 2.0 and their shooting percentage was 47% as a team, which had them ranked 59th. Behind the arc they shot 35% which was good for 182nd in D-1. They averaged 37.8 rebounds per game and 16.0 assists per game, which ranked them 72nd and 34th in those offensive categories. In the turnover department they ranked 17th with 15.2 per game. The Skyhawks were 259th in the country in defensive rating last season with 106.1, and their offensive rating of 108.9 was ranked 81st. They were 159th in college basketball in pace with 70.1 possessions per 40 minutes, and their eFG% of 54% was 60th. As a unit they were 84th in the nation in true shooting percentage with 56% and they shot 3-pointers on 39% of their shot attempts, ranking 114th in D-1. UT Martin was 39th in turnovers, as they turned the ball over an average of 18.3 times per 100 possessions while forcing 16.8 on defense. Their defensive eFG% for the year was 52%, which was 248th in the country. 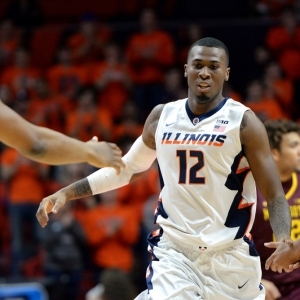 Who will win tonight's UT Martin/Illinois college basketball game against the spread?